Are you tired of waking up at 5 am during weekends to let your dog out because he needs to access his toilet? Are you sick of pausing your favorite TV shows to go and let your dog out? If so, you need a dog door. These doors give your dog more freedom as he can go out outside whenever he wants if the door is not locked. Dog doors are also convenient for you as you will not need to keep letting your dog out every time they feel like going outside. However, before you rush to Amazon to buy a dog door, it is vital that you learn more about these doors. While a high-quality dog door can lessen your work and be convenient for your dog, a low-quality door can compromise your home’s security and increase your energy bills. We have made the work easier for you by compiling an exhaustive buyer’s guide and a list of best dog doors. Each door we have reviewed here provides security, great value for money, and are energy efficient. We have reviewed different door types to help you find the right one for your home. We recommend you first read our buyer’s guide to knowing why you should invest in a dog door, different types of dog doors, and what to look out for in these doors. What Are the Benefits Of Investing In Best Dog Doors? 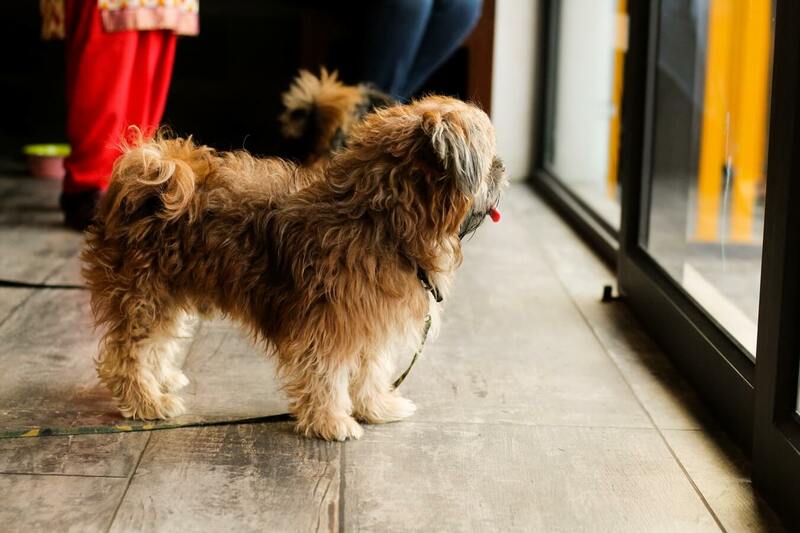 Even if your pooch is trained to urinate or defecate only at specific times of the day, there will be times when they feel they want to defecate or urinate earlier than their specified times. Unfortunately, if you are not at home during that time, then it means he will have to ‘hold it inside’ until you come home. Just like humans, your dog will feel uncomfortable and will suffer while trying to control their pee. With a dog door, you are giving him an opportunity to relieve themselves whenever they need to. In addition to relieving himself at his desired time, access through their door means more exercise and playtime for your dog. Exercise for him, maybe exploring your garden or playing in the backyard. Even if they have your company at home, dogs will still want to run and jump outside. Many pooches develop behavioral problems because of boredom. Pooches don’t have a wide area to play inside your house. Therefore, by giving them access to the outdoor environment, you will help them combat boredom. Besides, they will socialize with other dogs as well. This can act as healthy mental stimulation for your canine companion. Since they cannot communicate with words, dogs express their dissatisfactions or requests differently. For instance, many scratches on the door when they want to tell their owners they want to go out. This ends up damaging the finish of your entries. By installing a door designed for them, they will not have to scratch your precious door again. You don’t need to get up every time or pause whatever you are doing to open and close the door anytime your dog wants to go out or come back to the house. You can also relax on your couch without your pooch jumping on you, begging you to open the door for them so they can go and relieve themselves. A dog door will save you from all these hassles. Those are the main benefits of installing dog doors. Let’s now discuss the types of dog doors. This is the most commonly used dog doors and is designed to be mounted in the lower part of your house door. They are what many pet owners envision whenever the phrase “dog door” is mentioned. Different models work best with different types of standard doors, and thus you need to read the manufacturer recommendations before ordering your preferred selection. These are designed to be installed into a hole made on a wall, rather than a door. They are deeper and thicker than door-mounted models. Besides being difficult to install, you will also need tools and requisite skills for the tasks. Therefore, consider these conditions before selecting this style of dog doors. These are doggie dogs designed to fit in the gap created by sliding glass doors that don’t open fully. The designs are easy to install, but they are quite pricey than door-mounted models because they include a long section of the glass door. These doors vary widely. Some are passive units with programming options designed to restrict access while others open and close automatically. Some are designed to open and close when they are triggered by the RFID chip fitted in your dog’s collar. These doors are installed in standard home doors; not on glass doors or walls. Your family’s lifestyle and home’s layout will dictate the style that will work best for you. Most of the styles on the market are practical for usage by dogs, provided you buy the right size. With that in mind, let’s now discuss how to buy the best dog door. This is an obvious thing to consider; your dog should fit through the door for it to use it. Most brands would measure the size of the door with a dog’s weight, which remains practical most of the time. However, some dogs, such as the English Staffordshire have an unusual weight-size ratio. They have wide shoulders, yet they are a small breed. If you are unsure, check the door height and width, cut a hole on cardboard and get your pooch pass through it. Try to get the smallest door your dog can get through as an unnecessarily large door will create a security risk for your home. Most common dog doors involve fitting the door on your existing standard door or wall that cost hundreds or even thousands of dollars. Once the hole is cut, there is no going back. Therefore, it is important that you get a dog door that will last. Look for brands that have a warranty as well as those selling replacement parts such as flaps. Different doors have different locations where they should be installed. For example, dog doors that are designed for glass installations, are unusually round and have slim frames. This is because it is easier to cut a round hole on the glass. There are also doors designed for security doors and fly screens. Therefore, know where you want the dog door to be installed and find the right type. It is crucial to remember that your dog door will act as an air pathway; air will enter and leave your house through that opening. Even when entirely closed, a thin piece of plastic or aluminum will not be the same as a wall or door. Therefore, it is important for owners living in extremely cold or warm climates to consider this. Some dog doors cater for this problem by including two or three flaps, instead of a single flap. This helps to trap air in the door cavity which helps with insulation. Still, if you are looking to ensure energy efficiency in your home, it is important to consider how long a dog door will affect the cooling and heating of your home. Most dog doors have the same type of locking system on them; either a little locking latch on the side or a full slide-in panel blocking off the door. Slide in panels are more secure, but the locking latch system can offer out-only or in-only modes. Pet doors provide an extra entryway into your house. Therefore, you will want to consider the security implications of these doors when selecting a design. Most high-end units feature a sophisticated locking mechanism, which prevents unauthorized or other dogs and animals from entering your house. However, the downside is that you can only engage the lock when your dog is safely inside. This decreases the value of the dog door since the key benefit would be the ability to control the lock both from the outside and the inside. Manufacturers are trying to address this problem by using smart doors, which have a system that reads the microchip fitted on your dog’s collar. Such dog doors allow your pooch to enter while keeping out any other animal. Additionally, some doors are programmable, especially the electronic doors, thereby enabling your pet to enter or exit through the door at specific times. Dog doors are made of varying materials, but most of them are made from some tempered plastic or aluminum. Aluminum doors tend to last longer, although tempered plastics is also adequately strong. Now that you are more enlightened and better-positioned to choose the right dog door, here are the best dog doors 2019. This door from Ideal Pet Products is designed to offer sufficient insulation while giving your dog freedom to go out. The unit promises great energy efficiency and will last long. The inclusion of a telescoping frame makes it easier to install. While the door comes at a lower price, it looks decent and provides powerful benefits such as double flap and telescopic tunnel unit. Setting up this pet door is pretty easy with the aid of precise instructions and cutting guides. This pet door has all the basic features you need in a pet door having been made strong to last. It offers a secure and effective way to let your dog out when it matters most to them. A limited lifetime warranty keeps your investment safe. The BarksBar Premium Dog Door is a durable investment featuring materials that don’t feel cheap. The easy to install unit comes with an installation guide for quick installation. For safety concerns, the sliding panel is included to lock the door when it’s not in use. The pet door is worth the money because it’s super easy to install and features quality materials. All pet sizes can use the unit with a sliding panel to lock the door when not in use. The flap works well too. Some customers complained about the included vinyl screws not holding up for long. Your furry friend’s comfort and freedom to move along plays a considerable role in how the two of you relate. The PetSafe Freedom Aluminum Door is not only comfortable for your pet to walk through but is also sturdy enough to prevent breakage. The door has a maximum height capacity of 14 inches which is on the lower end. Therefore, if your dog grows past this height, you will be forced to upgrade. Dog Mate Door features a four-way door lock system that will allow your pets to enter or get out comfortably and without having to squeeze into tight fittings. The pet door features a weatherproof construction to keep away cold elements. This product features heavy-duty construction with a durable frame and weather-proof materials. You can choose between single and double flaps which is an interesting solution because flaps improve energy efficiency. This product majorly made it to this list of best dog doors 2019 for its sturdy construction and effective design. Installing a dog door in a standard door is usually straightforward and easy. The best dog doors come with simple and clear instruction manuals and also include all the tools needed for installation work. Take your time to read the manual before and take care when installing these doors since incorrect installation can compromise security in your home and reduce energy efficiency. You may need to leave the flap off the dog door for one day. Therefore, ensure you secure the door using the sliding lock at night. This will help teach your dog to use the door with the flap on. If you have purchased a dog door designed to be installed in walls or glass panels, we would recommend that you hire a professional. Wall installations are quite a process as opposed to installation on regular doors. You also need to check if there are water pipes or electrical wires in the way. Dog doors can be a convenient and great way to provide your dog or pup with more freedom. It is therefore vital to install a high-quality dog door that is secure, energy-efficient, and easy to install. We hope that our review of best dog doors on the market as well as our detailed buyer’s guide will enable you to make the right choice for your home.